This is the second post looking at the two questions I most often get asked by pastors when I speak about organic church movements. Question Two: I often get asked by preachers when they begin to understand that Sunday morning worship services are not the best/only avenue for changing lives and equipping the saints: "But what do I do with my gift?" Granted, some of the people asking are not actually THAT gifted, so its likely the world would not notice if they stopped speaking every Sunday. But I remember when Francis Chan asked me that same question. No one can argue that Francis is not made by God to speak to an audience, but even he had to count this cost...and he did. My usual answer to this question goes something like this: If God has given you a gift He wants you to use it and will give you the opportunity to do so. But one thing I am sure of, He doesn't want you to use your gift at the expense of everyone else in the room not using theirs. That is not the way it is supposed to be. I used to love preaching every Sunday. I would spend 20-30 hours a week preparing my sermons. If you were to tell me back then that I would give up preaching from a pulpit every Sunday I would not have believed you. I distinctly remember early one Sunday morning, however, as I was putting the finishing touches on another "great" sermon that I felt the Lord's presence with me. He whispered in my ear (not audible), "You know, Neil, you are never going to start the 3rd great awakening by preaching a sermon." That was all I heard Him say to me and with that He challenged me to understand that it is much more than preaching sermons that is needed to awaken the kingdom of God in people and start a movement. From that point on, I counted the cost and became open to other ways of equipping the saints. I became discontent with only challenging a few people and would pursue something that would launch movements of people. I also became a better preacher. No matter how good you are at preaching (and lets face it, you're probably not as good as Francis Chan), you need to weigh your own personal fulfillment against the fulfillment of the ministry of the Saints in the body. Are you willing to surrender your gift for the sake of the people you are preaching at? That is a true test of your faith and your calling if you ask me. I would imagine that if you count the cost and are willing to pay the price for the sake of others then you do have something valuable to say and God will find a way to use your gift. If preaching is more important to you than the people you are preaching at then you should probably prepare yourself to find another line of work. Its not just what you say that makes you significant; it is the life within you–that you live out between services–that makes what you have to say significant. Living with Jesus among His people and on His mission is more important than just preaching about Jesus. If you live a courageous life of faith in Christ then you will not only find you have lots to say, but that others want to hear it. I like your thoughts. They are compelling to chew on and digest. Will be doing that over the next few weeks. What I missed is a practical application or example to better understand (at least for this simple minded preacher) how this is done... how it demonstrates itself in the life of a preacher? What does this look like, applied? Jon, that is because what I have found is that each path is a unique design of God. To lay down a road map could violate that beauty. God can show you better than I. It really is a life of faith where each step must be taken believing it is what God wants even if it costs everything you value. Trust that you will not be disappointed in the end. The one who gives the gifts issues the call. Just because "each path is unique" doesn't mean you can't give some examples to help people better understand what you are trying to communicate. I've read your books where "examples" are found, and I've listened to and read Dallas Willard on "incarnational living", I agree it is different for each of us, and only now in my 60's do I feel like I've found that life that is "hidden in Christ". I personally counsel intimate "spiritual direction" with a soul friend, though I believe time spent with God in solitude may lead to the "answer". Bill, I might suggest possibly using the various "tools" outlined in the latest issue Conversations journal, volume 11.1 for some guidance. I found the exercise invaluable personally. Bill and Jon, I have found that when people get out of the sermonizing business alone and start making disciples out among the lost it changes everything. Stories become compelling. Opportunities open. Others will want to hear about the life changing work. 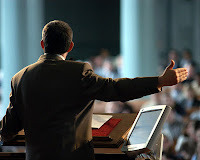 Even if you continue preaching, your work will be more meaningful and others will want to hear what you have to say. You will also feel better about yourself and what you are doing. I would hesitate to get more specific than that for fear of setting expectations that would restrict the beautiful creativity of God's design on your life brother. The point is that you can trust the one who gives the gifts...right? Do you really need me to tell you how the Gift-giver wants to do it? I don't think so. Bill, In a later chapter of Organic Leadership I give many examples of church leaders that left the pulpit and found greater significance. In Journeys to Significance I describe the journeys that God brings a leader through to greater impact. In Church Transfusion I write about how to bring organic change to an existing congregation and several chapters are devoted to the changes needed in the leader in that church. I do not want this to be a commercial spot, but you asked for tangible examples which I have given in each of the above resources. I do hope that helps some. When God called me to leave my position with a burgeoning megachurch to take a more missional approach, I assumed I'd be doing the 9-5 thing in a secular job. God had other plans. He brought me to a church that has given me the opportunity to teach the Bible on Sunday morning while sowing organic life out in the harvest. Our leadership has remained committed to staying lean enough in our programming for me to do that. Praise God, he can do it all! Trust me when I tell you all that the stories are as diverse as they are many of how God has led people to use their gift in this movement. In fact, there are many times when I have seen Him lead people in exactly the opposite direction that I would think wise, and proved me wrong. So trust me when I hesitate to tell you how it will work. What is most important is the willingness to surrender your preaching and your role (and gift/calling) to Jesus...that's the start. I've been really drawn to and challenged by this mindset. As a young "dude" with just enough vocational ministry experience to count on one hand, I'm already feeling a little torn between the two feelings. I can really appreciate that there's no one "right" answer, or even a set of "best practices" - but that's also the challenging part. Like most ministry leaders, I like a good list of ideas to implement. But I'm acutely aware that that can easily bypass the whole "listening to God" thing. I'm reminded that Alan Hirsch says in Forgotten Ways that to activate more of the congregation all at one, you need to go smaller, which immediately made me feel like you two had talked about that over coffee one day. I think the tension is healthy and needed, but it's still kind of uncomfortable. Puck, yep, there's no doubt that a life of faith is outside of the comfort zone. The hardest thing in my ministerial life has simply been 'letting go'. For me there was a lot of pride that got in the way of letting the Spirit do what only he can do. However, we are beginning to see spontaneous multiplication with even pre-Christians starting up new discipleship groups. The idea of this used to scare me (and, to be fair, I still feel a bit nervous about it), but God seems to know what he's doing! Thanks for the resources Neil, Church Transfusion should be most helpful in my current situation...er conundrum. So, what's up with Francis Chan? What is He doin now? Having left preaching ministry behind several years ago, and now being involved in something much more organic in a poorer part of our city (it's still in the seed stages), I have seen a huge difference in my preaching when I get the opportunity. This post is right on. Thanks for the wisdom, Neil. Chiefer, I watched a recording of Francis Chan just the other day, part of the Verge 2013 package available as a paid-for download. "I have found that when people get out of the sermonizing business alone and start making disciples out among the lost it changes everything." I am not yet convinced all preachers are in the sermonizing business. For those who are not, your position can easily be a both and instead of an either or. I love listening to and reading Francis Chan but I have some dear spiritual warriors I worship with who prefer a different style. Since an example cannot be given, can you share with us what it looks like in your life? If there are others here who have chosen this path, can you share your story. Something to make this seem more like life and less like a fad.